Refurbished medical imaging equipment are restored to the original specification when these were purchased new. Medical imaging equipment are refurbished in two ways; cosmetic refurbishment and mechanical-electrical refurbishment. The cosmetic refurbishment process includes painting and surface treatment. The electrical-mechanical refurbishment process comprises complete restoration of the equipment, including parts and other critical components. The refurbishment process is validated and accepted through various governing bodies such as COCIR, NEMA, and International Association of Medical Equipment Remarketers and Servicers (IAMERS). In 2017, the global refurbished medical imaging equipment market was valued at US$ 903.2 Mn and is projected to expand at a CAGR of 5.4% from 2018 to 2026. Refurbished medical imaging equipment are considered cost effective alternatives to new equipment, as these are 30% to 60% cheaper. This allows smaller diagnostic facilities to lower operational cost and helps in reducing waste generation. Refurbishment of medical imaging equipment is carried out in accordance to the Good Refurbishment Practices (GRP). According to the guidelines, “Refurbishment process has to be carried out according to the original product description and service procedures as mentioned by the OEMs (original equipment manufacturer). The global refurbished medical imaging equipment market has been segmented based on product, end-user, and region. In terms of product, the product type is further segmented into CT scanners, MRI systems, X-ray systems, ultrasounds, and others. Based on end-user, the global refurbished medical imaging equipment market has been divided into hospitals, diagnostic centers, ambulatory surgical centers, and others. Rise in demand for cost-effective and high quality medical imaging equipment, improvement in sales support systems, increase in awareness about circular economy from OEMs, and surge in disposable income are factors likely to fuel the growth of the global refurbished medical imaging equipment market during the forecast period. In terms of region, the global refurbished medical imaging equipment market has been segmented into North America, Europe, Asia Pacific, Latin America, and Middle East & Africa. North America is expected to account for major share of the global market during the forecast period, followed by Europe. Increase in mergers and acquisitions, rise in demand for advanced imaging equipment, and cost constraint methods adopted by health care facilities such as hospitals and diagnostic centers are expected to augment demand for refurbished medical imaging equipment in North America and Europe during the forecast period. The market in Asia Pacific is anticipated to expand at a higher CAGR during the forecast period from 2018 to 2026. Rise in patient population, and increase in geographical footprint of major manufacturers are expected to fuel the growth of the refurbished medical imaging equipment market in the region during the forecast period. Major manufacturers have a well-established distribution channel spread across the world. Increase in participation of a number of regional players, especially in the emerging markets in Asia, the Middle East, and Latin America is anticipated to contribute to the growth of the market in these regions from 2018 to 2026. Increase in mergers and acquisitions, and strategic partnerships between public private organizations are expected to drive the global market during the forecast period. For instance, in April 2018, Merry X-Ray Corporation acquired Nationwide Imaging Services, Inc., one of the leading suppliers of refurbished imaging equipment and parts. Major players in the global refurbished medical imaging equipment market are GE Healthcare, Canon Medical Systems Corporation, Koninklijke Philips N.V., Atlantis Worldwide LLC., Block Imaging International, Inc., Siemens Healthineers AG, Hitachi, Ltd., Shimadzu Corporation, Carestream Health, and Fujifilm Holding Corporation, among others. This report on the refurbished medical imaging equipment market analyzes the current and future scenario of the global market. Increasing technology obsolescence, favorable after sales support, surging demand for low-cost and high-quality imaging equipment, growing awareness about circular economy, and rising strategic collaboration among OEMs and distributors are factors likely to drive the global refurbished medical imaging equipment market during the forecast period. This report on the refurbished medical imaging equipment market comprises an elaborate executive summary, which includes a market snapshot that provides information about various segments of the market. It also provides information and data analysis of the global market with respect to segments based on product, end-user, and geography. A detailed qualitative analysis of drivers, restraints, and opportunities for the market has been provided in the market overview section. In addition, the section comprises competition matrix and profiles of companies along with their business overview to understand the competition landscape of the market. This section of the report also provides market attractiveness analysis, by geography and market share analysis, by key players, thereby presenting thorough analysis of the overall competition scenario in the global refurbished medical imaging equipment market. Based on product, the refurbished medical imaging equipment market has been segmented into CT scanners, MRI systems, X-ray systems, ultrasound, and others. The product segments have been analyzed based on technological advancements in manufacturing. Based on end–user, the global refurbished medical imaging equipment market has been divided into hospitals, diagnostic centers, ambulatory surgical centers, and others. The market size and forecast for each of these segments have been provided for the period from 2016 to 2026, along with their respective CAGRs for the forecast period (from 2018 to 2026), considering 2017 as the base year. Geographically, the global refurbished medical imaging equipment market has been categorized into five major regions and key countries in the respective region as follows: North America (the U.S., Canada), Europe (the U.K., Germany, France, Spain, Italy, and Rest of Europe), Asia Pacific (India, China, Japan, Australia & New Zealand, and Rest of Asia Pacific), Latin America (Brazil, Mexico, and Rest of Latin America), and Middle East & Africa (South Africa, GCC, and Rest of Middle East & Africa). The market size and forecast for each of these regions and the mentioned countries have been provided for the period from 2016 to 2026, along with their respective CAGRs for the forecast period (from 2018 to 2026), considering 2017 as the base year. The research study also covers the competition scenario in these regions. The report also profiles major players operating in the global refurbished medical imaging equipment market based on various attributes such as company overview, financial overview, product portfolio, business strategies, and recent developments. 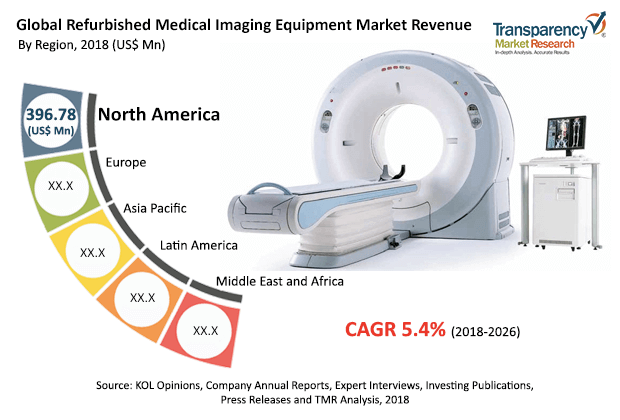 Major players operating in the refurbished medical imaging equipment market are GE Healthcare, Canon Medical Systems Corporation, Koninklijke Philips N.V., Atlantis Worldwide LLC., Block Imaging International, Inc., Siemens Healthineers AG, Hitachi, Ltd., Shimadzu Corporation, Carestream Health, and Fujifilm Holding Corporation.